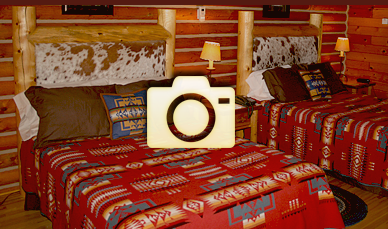 Wyoming Guest Ranch History - The Hideout Western Experience. The story of The Hideout Lodge & Guest Ranch consists of many tales and experiences that when melded together create “Your Experience”. The stories below attempt to put into words the type of experience that you can expect while vacationing at The Hideout in Shell, Wyoming. Our staff comes from different backgrounds, cultures and education. Each staff member has a story that reflects why they love to work at The Hideout and why they believe that this is the best valley and place to call home. The Hideout staff all share a genuine passion for the West, hospitality, horses, respectful horsemanship, ranching, quality, the outdoors and being a part of offering you the best and most unique guest ranch vacation. We want The Hideout Lodge & Guest Ranch to be the best guest ranch to work at, as we believe a happy, well respected and passionate staff is the foundation of an exceptional guest experience. What sets us apart from most other guest ranches is that our key staff lives and works in Shell year-round with their family. Read more about our culture. Many of our guests come to The Hideout looking for an experience that includes equestrian activities, the remote outdoors, an authentic ranch experience, upscale pampering and bonding with people from around the world. Guests are looking to enjoy a week in what they define as a “perfect world”. Our repeat guests notice that each year we strive to do better and make improvements to The Hideout. Guests arrive from around the world and return frequently. Each guest has stories to share about The Hideout, but they will all agree that the reason they return is “The Hideout Story”. In the end, returning guests and positive word of mouth are the best way to understand our guests’ satisfaction. We do not take this for granted. On the contrary, it puts more weight on our shoulders to do better every year. 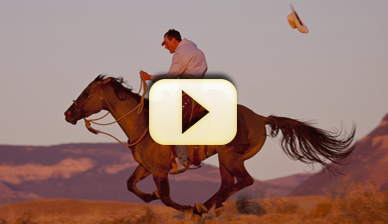 Horses are the heart of any riding and horsemanship guest ranch. 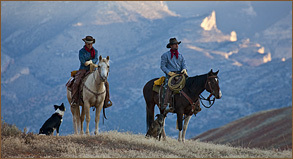 We believe that our horses are as good as they get at a guest ranch. 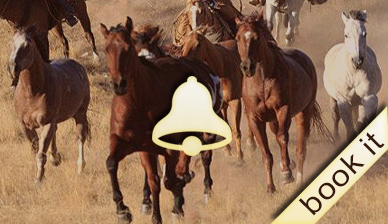 Whether you ride every day or are swinging into the saddle for the first time, we have the horse that is right for you. Natural horsemanship is standard practice at The Hideout. This means we handle our horses in a gentle manner, designed to keep their stress, and ours, to an absolute minimum. Our year-around barn team continues to train and fine tune our guest ranch horses and offer clinics and training at The Hideout Lodge & Guest Ranch. Marijn, one of our owners, recently passed her Parelli Level 4 Certification. 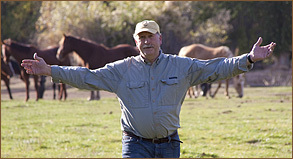 Each week Tom, our head wrangler, gives an introduction to Natural Horsemanship and throughout your stay we want you to learn more about riding and horsemanship. When it comes to trainers, clinics, methods and philosophies of how to work, play and improve our horses and our staff, we are open to learn from any concept that is respectful, professional, fun and ethical towards both horse and rider. If you are interested in a horsemanship clinic and training week with a top level natural horsemanship and equestrian professional, you can book a week at our sister ranch, The Trapper Creek Ranch, which is also located in Shell. For more information visit www.ahhorsemanship.com. 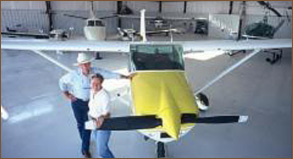 David Flitner and Paula De Cabooter-Flitner founded Hideout Adventures Inc. in 1992. In 2006, Peter De Cabooter (Paula’s nephew) and his wife Marijn Werquin took over the reins. Together with Tom, our Head Wrangler, Rebecca our Office Manager, Marco our Head of Maintenance, Chef Mary, Guille our Head of Housekeeping and their teams, we have expanded The Hideout to what it is today. 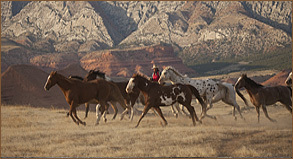 The Hideout Lodge & Guest Ranch is an upscale riding, natural horsemanship and working cattle ranch, offering an array of non-riding activities. Paula, like Marijn and Peter, is a Belgian native, who moved to the US almost 60 years ago. She has lived, among other places, in New York, California, Florida, Belgium, France, and Switzerland and has traveled throughout the world. Peter, leaving an international corporate job, moved from Brussels Belgium to Shell, Wyoming with Marijn and their twin sons Edward and Victor. The Hideout welcomes a growing number of visitors from around the world each year, and leverages diversity as an asset. Marijn and Peter bought The Hideout from Paula in 2017 and are now the new owners of the ranch. In 2012 Rebecca and Tom Bercher, with their children Augustus and Seamus, joined The Hideout crew moving to Shell from Northwest Arkansas. Prior to this Rebecca and Tom had been guests at The Hideout three times. Tom is The Hideout’s Head Wrangler and Rebecca manages the office, reservations and guest services. Other members of our team like Marco and Ever Chavez who are in charge of maintenance, fields, repairs, landscaping, remodeling and much more, have worked full time at The Hideout for over 15 years. Our head of housekeeping Guille, has been a member of our team for more than 20 years. Many of our seasonal employees have been coming back year after year to work with us during our eight month season. Our team and culture are the real heart of The Hideout. 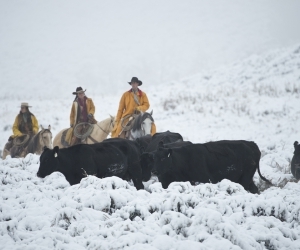 Over the years The Hideout has evolved from a predominantly working cattle guest ranch to become one of the foremost riding, horsemanship and working cattle guest ranches in North America. Even during our high season, we limit our riding guests to approximately 25 riders per week. Less is more, and we feel this maximizes the guest experience. With a string of approximately 130 horses we assure excellent mounts at all times for our guests while ensuring appropriate rest periods for our team of horses. 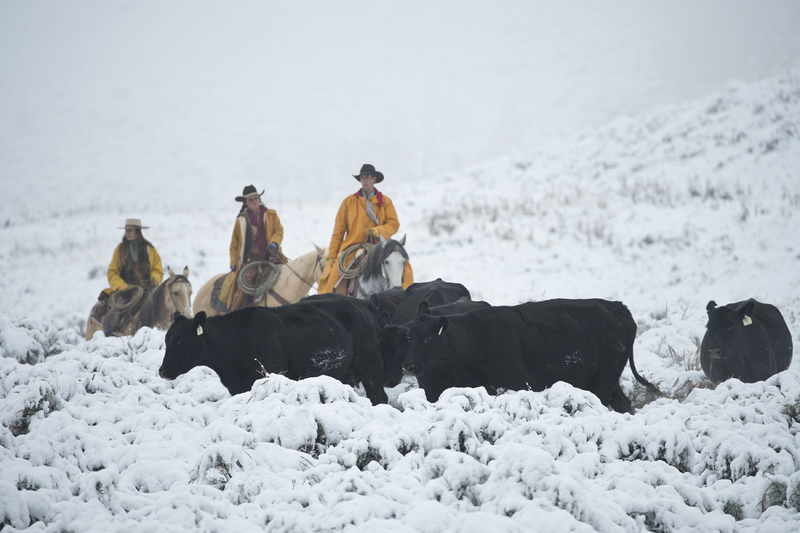 Our horses are bred and raised for this challenging terrain. This will keep our guests safely mounted for a day of moving cattle or during fun and exciting trail rides. In addition to Quarter Horses and Paints, we also have a growing number of Mustangs in our riding string for intermediate and advanced riders. Under the experienced and well-traveled hospitality leadership of Paula Flitner, The Hideout started out offering good Western fare. 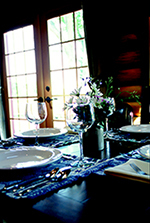 Over the years keeping up with the trends in the food industry and restaurants, The Hideout Lodge & Guest Ranch has become more and more known for offering an excellent culinary experience. Over the last several years, with the help of experienced chefs, we have brought the culinary experience at The Hideout to the next level. The Story of Shell and The Big Horn Basin. 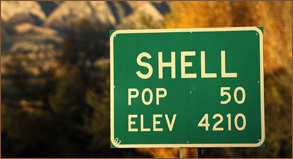 The Hideout is located in Shell, Wyoming, (population 83, elevation 4200 feet) in the beautiful Shell Valley of the Big Horn Basin at the entrance of the dramatic Shell Canyon. It is only 110 miles east of Yellowstone National Park, and 76 miles east of Cody, Wyoming. 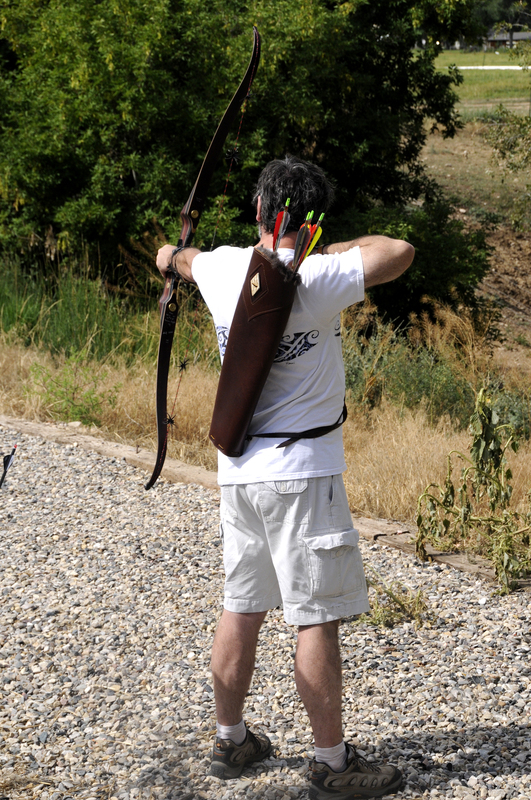 The nearest town across the Big Horn Mountains is approximately a one-and-a-half hour drive. The story of Shell starts millions and millions of years ago, and the many exposed formations are a visible testimonial of this history. Shell is a popular destination for paleontologists from around the globe digging for rare species of dinosaur remains and other fossils. 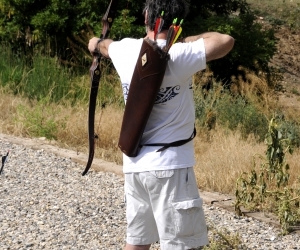 At 4,200 feet in the high-desert valley of salt sage, cactus, and prehistoric dinosaur discoveries, we climb the rocky canyons of Shell Creek, White Creek, and Trapper Creek through wide-open range, to an elevation of over 10,000 feet in the Bighorn National Forest and Cloud Peak Wilderness. The Big Horn National Forest comprises 1,300,000 acres and is one of the oldest National Forests in the US. The Cloud Peak Wilderness Area at 187,000 acres, has elevations which measure up to 13,067 feet. The green alpine meadows and pine forests are home to the majestic elk and mule deer. Crystal-clear mountain lakes and streams harbor native trout.